Curious about what John Elliot's been up to with the Erie Inland Port Project? Our writer dishes the scoop from the information session held at City Hall last week. John Elliot's Inland Port Project is in full swing. With businesses now in the fold, Elliot delivered a presentation to City Council on February 24 at City Hall, highlighting new developments and reiterating current plans for the Inland Port Project. Elliot, the president and CEO of the Economic Development Corporation, and Katrina Smith, vice president and chief operating officer of the Economic Development Corporation, addressed council to provide an update of the operations and offer insight into what they see as a promising endeavor. Enthusiasm poured out of John Elliot as he described his tour of several ports in Europe with the U.S. Department of Transportation and the Canadian Ministry of Transport. "Bulk transportation is the main focus of these ports in Europe," Elliot said. "Small countries, like the Netherlands, have built monster industrial economies that are clean, efficient, very modern, and based on bulk transportation." This is the direction that Elliot desires to take both the ports of Erie, PA and Conneaut, OH. Four weeks ago Elliot met with a company that has seven hardwood processing facilities in West Virginia, Pennsylvania, and North Carolina. The company found that it could load 20,000 tons of wood pellets onto ships and be ready for direct departure to Europe. "Based on their forester's analysis," Elliot said, "they could do a development in Erie or Conneaut for 350,000 to 400,000 tons a year of wood pellet processing." Elliot believes that the manufacturing of goods portside contributes to the success of the European ports because it minimizes the cost of transportation by eliminating transport of the commodity from the production facility to the shipment sites. "At the port of Antwerp, in Belgium, there are 140,000 people working on those docks," Elliot said. "There is 53 million square feet of warehousing and manufacturing activity right around those docks." Identifying and developing such opportunities is what Elliot sees as the heart of the Inland Port Initiative. And concentration on the ports of Erie and Conneaut creates the potential for doubled assets to draw from. "We're focusing on the unique capabilities of each port," Elliot said. 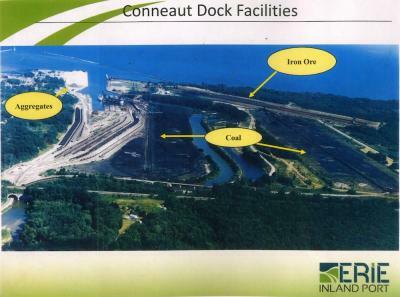 "We have a 300-ton crane (one of the two biggest cranes on the Great Lakes, Elliot mentioned earlier) and a shipyard; Conneaut has a lot of conveyor systems and a lot of raw, available land in addition to rail capacity. Each port has unique assets and capabilities and we'll be promoting both of them." Elliot and Smith are now in the process of looking for businesses to plug into the port idea. Smith took the floor to inform the council about REXAM Closure Systems Inc. and its project in connection with the Greater Erie Industrial Development Corporation to build a new facility next to the existing one at 316 West 16th Street. This project stands to sustain 130 jobs as well as create an additional 40 jobs over a three-year period, which might come as a comforting certainty to those of the labor force-- especially, one of the main overall objectives of the Inland Port Project is to improve employment. "A community like Erie has struggled for a while figuring out what its next economic move is," Elliot said. "We had a strong industrial run in the '40s, '50s, and '60s and then its really been in decline from an employment perspective, productivity is a different story, but employment has been down. "We're also trying to figure out what is our opportunity in an increasingly global marketplace and what advantages we have to build on," Elliot said. "We want jobs that create influx of capital. This is a way to grow the community's wealth and create opportunities for jobs, which creates opportunities to increase the tax-base." Overall, Elliot and Smith see the mission of the Erie Inland Port Project as making Erie a global competitor in industry development and logistics. This large-scale initiative hopes to maximize the industrial potential of the region and improve the economy. According to Elliot and Smith, Erie community members should look forward to the possibilities of better jobs and overall growth the project aims to initiate. Rather than harping on the depressing circumstances of our country's current economy, Elliot and the Economic Development Corporation are taking steps to usher Erie into a better position for the future.